30 Year Anniversary!! Special Discount Prices! We have a saying here at FSP worldwide headquarters: The more the merrier! Do yourself a favor and order all four FSP publications -- the Pro Forecast, CheatSheets, FootballDiehards and DraftBook -- and save yourself some coin. Remember: There's safety in numbers and numbers don't lie. See individual magazine listings below for expected delivery dates. 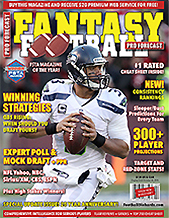 Exclusive draft strategy from Daily Fantasy winner as well as articles on the 2019 NFL Coaching Carousel, Strength of Schedule, Fantasy Rookies, an Interview with the FFWC Champ, Draft Strategies, Draft-Day Questions with this year's Top Picks, an Offensive Line Study and IDP Strategies. 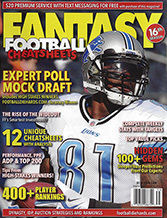 Fantasy Football CheatSheets Magazine enters its 22nd Anniversary season after being named Fantasy Football Field's and FSWA "Magazine Of The Year" in each of its first two seasons. ... And that ain't bad. Also the CheatSheets won the FSWA 2010 Magazine of the Year Award! The 25th annual DraftBook focuses on the NFL draft and post-draft mini-camps along with details player capsules, stats and an expert Mock Draft. 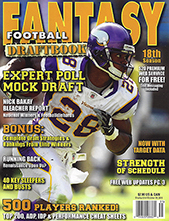 Also: Experts Poll, Mock Draft Daily Fantasy Tips, Top 200 Overall Cheatsheet, Team Reviews, Position-by-Position Player Profiles (180+ players), Comprehensive Individual stats, Weekly Stats, IDP stats and more as well as articles on Value Picks and Sleepers, Draft Strategies and more! The 2019 Football Diehards includes our unique blend of Expert Prognostication, Daily Fantasy advice, Mind-Bending Stats and an assortment of informative and entertaining Fantasy-specific articles. Also articles on impact moves, bargains and busts and draft strategy -- along with player capsules, team report cards, a rookie preview and more! Also the Diehards won the FSWA 2016 and 2017 Magazine of the Year Award! 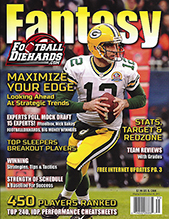 The Football Diehards is one of the last Fantasy magazines to hit the newsstands each summer and offers news that is more pertinent on your Draft day. I great blend of Fantasy Draft advice and Daily Fantasy Details.